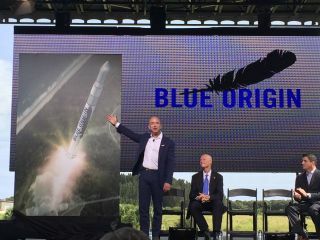 Jeff Bezos announced on Sept. 15, 2015 that his spaceflight company Blue Origin would have a launch facility at Cape Canaveral Air Force Station, Florida. This week, Jeff Bezos announced that Blue Origin would make a home on Florida's "Space Coast,"; scientists confirmed that an ocean lies beneath the surface of Saturn's moon Enceladus; and NASA astronaut Scott Kelly reflected on reaching the mid-point of his one-year stay aboard the International Space Station. This is our roundup of the best space stories of the week, for Sept. 18, 2015. Billionaire and CEO of Amazon.com Jeff Bezos announced this week that his private spaceflight company Blue Origin will manufacture, test and launch its orbital rockets from Launch Complex 36 at Cape Canaveral Air Force Station in Florida. NASA astronaut Scott Kelly and Russian cosmonaut Mikhail Korniyenko are in the middle of the longest consecutive stretch spent on the International Space Station. How are they holding up with six more months of spaceflight to go? When humans finally set foot on Mars, they could settle down in homes that build themselves. The Self-deployable Habitat for Extreme Environments (SHEE) project is working on autonomously deployable space and terrestrial habitats. Who is in the billionaire's space club? Jeff Bezos, Elon Musk, Richard Branson and Paul Allen have all used their fortunes to start companies that want to make spaceflight more like commercial air travel. Here's some background on each of these men, and what each of their companies offers potential customers. NASA may delay the launch of its Orion spacecraft, a next-generation crewed vehicle intended to take humans to distant locations like Mars. The launch was initially targeted for August 2021, but after reviewing the status of the program, agency officials said the Orion launch could be delayed, although no later than April 2023. The U.S. Defense Advanced Research Projects Agency, DARPA, is developing a robotic arm that could be useful for repairing, refueling and building spacecraft in orbit around Earth. The agency said space-based pit stops will be necessary if space-based traffic is to increase, similar to the way port cities arose with the increase in sea travel. Launched in 1995, the Solar and Heliospheric Observatory (SOHO), built to study the solar wind, has identified 3,000 new comets in its 20-year lifetime. Many of the comet discoveries were made by citizen scientists sifting through the observatory's publicly available data. Social media exploded after news that Texas middle-school student Ahmed Mohamed was arrested after teachers mistook his homemade clock for a bomb. NASA, former astronauts Chris Hadfield and Daniel Tani, and "Mohawk guy" Bobak Ferdowsi were just a few of the people who voiced their support for Ahmed. Asteroid mining could make water and other valuable materials available for space colonies and space-based industry. A new idea called "optical mining" would use mirrors to heat the asteroid and an inflatable bag to collect the water. NASA's New Horizons mission continues to send back breathtaking images of the dwarf planet Pluto. It's most recent gem: a snapshot of a Plutonian sunset. The light makes the thin, hazy atmosphere clearly visible, while towering ice mountains cast long shadows. Despite observing water geysers erupting from the surface of Saturn's moon Enceladus, scientists had been unable to confirm if the icy moon held an ocean beneath its crust, or just an isolated lake. Now, researchers say the slight wobble of the planet is likely caused by an entire ocean sloshing down below. Two filmmakers made an actual scale model of the solar system. With Earth the size of a marble, the model — built in a flat, empty section of desert — was 7 miles (11 kilometers) wide.